Conquer Chiari has funded over $3.8 million in research projects. View the Presentations and Posters from the 2018 CCRC Open House. The Conquer Chiari Research Center (CCRC) is interested in studying CT images of children diagnosed with Chiari. 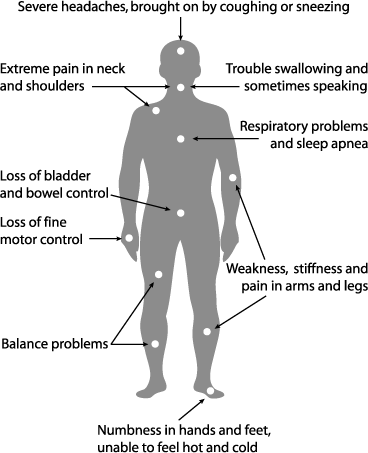 If your child had one or more CT scans of the head/neck and you are willing to share them with the CCRC please help with the project by emailing dloth@uakron.edu (or if you have questions and want to learn more). The first 1,000 patients to participate, and complete ALL parts of the project, will receive an exclusive Chiari 1,000 t-shirt. Sign Up today! Interested in donating your body for Chiari research? Conquer Chiari has partnered with the University of Maryland Brain and Tissue Bank to establish a procedure for interested patients to register with the tissue bank using a special code created for Conquer Chiari. a serious neurological disorder where the bottom part of the brain, the cerebellum, descends out of the skull and crowds the spinal cord, putting pressure on both the brain and spine and causing many symptoms. Children cannot always verbalize what they are feeling, sometimes the first clue is lack of proper development, either physically or cognitively. 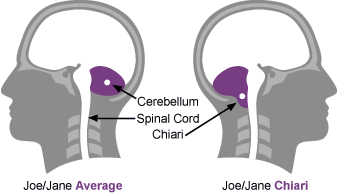 Fortunately, pediatricians are becoming more aware of Chiari, resulting in quicker diagnoses for children. 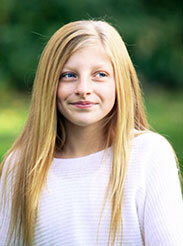 Click on Nicole's picture to enter our pediatric section for pediatric related articles, literature and support. The 12th Annual CCWAA will take place on September 21st & 28th 2019. Click the Apply button to apply to organize a walk site. Mightycause is our preferred online fundraising website, click on image to set up a fundraiser today. An easy to read book that guides readers through different stages of Chiari, with valuable tools and information necessary to take charge of their health care and make informed decisions.